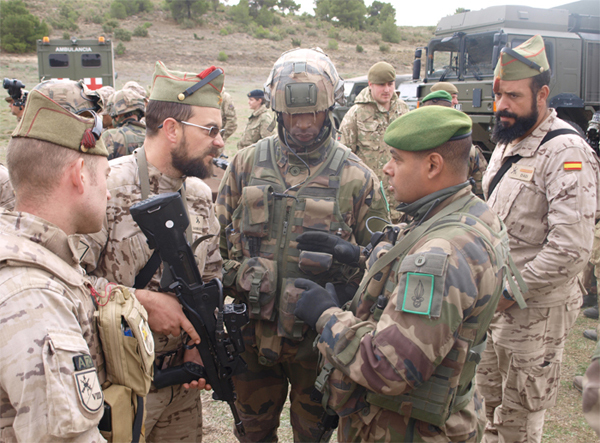 Between 15 and 29 November, around 400 Spanish legionnaires from Spanish Legion’s VIII Bandera, some 40 French legionnaires from Foreign Legion’s 2nd Foreign Infantry Regiment (2e REI) and about 100 British soldiers from The Royal Welsh, Welsh Guards and Irish Guards were improving their multinational operation skills (by using each other’s weapons), and also the tactical and communication skills in the field. The Spanish Legion, formed in 1920, was originally intended as a Spanish equivalent of the French Foreign Legion, to conduct Spain’s colonial campaigns in North Africa. Since the 1980s, the Spanish Legion has been closed for foreigners, except for the spanish-speaking citizens from former Spanish colonies (according to the Spanish Army official website).